And no, this is not an “Islamist lie” like Maajid Nawaz seems to have informed you. It is however, a neoconservative conspiracy, which spans the inception of the War on Terror. 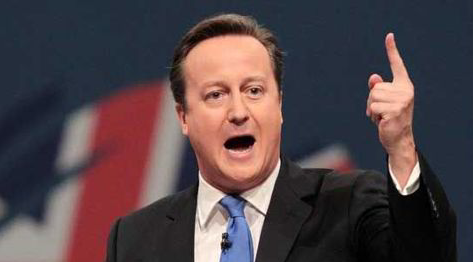 David Cameron’s doublespeaking speech was incessant in its assertion that there is no conspiracy to “destroy Islam”. Increasingly, it seems that practically any argument, however well referenced, even academically-backed, is to be rapidly brought into the sphere of “extremism” or “Islamism” and suppressed through State apparatus. They have become the terms through which the government is censoring counter-narratives. For neocons, “active opposition” to their civic religion of secular liberalism and its symbols – “British values” of democracy, rule of law and human rights – is equivalent to “undermining” it. It is “an attack” no less. To protect it, the state has effectively deployed the counter-extremism and terrorism industry. However, the double-standards applied by neocons means that any effort to undermine Islam, as understood from the time of the Companions of the Prophet Muhammad, peace be upon him, and explained and refined through the past fourteen centuries by thousands of Ulama – scholars of impeccable learning and piety – cannot be seen as an “attack on Islam”. Nay, for David Cameron and his colonialist brown-sahibs, it is part of the “Islamist” narrative. Presumably the “extremism” policy, which imposes an extreme interpretation of secular liberalism on Muslims and an opposition to it seen as “undermining our values”, is also part of the “Islamist” narrative. The neocons of that time who were busying themselves in creating the mess in the Middle East we have today, attacked the foundations of Islamic learning. In a speech at Georgetown University on the 30th of October 2003, Wolfowitz described madrassahs as “schools that teach hatred, schools that teach terrorism” while providing free “theologically extremist teaching to ‘millions’” of Muslim children. “As critics of the PREVENT programme had already stated, one of its more covert objectives was for Government to prompt a substantive change in the attitudes and beliefs of Muslims; possibly even to prompt the creation of an institutionally approved, ‘mainstream’ and ‘moderate’ expression of Islam that would be dually endorsed by various co-opted ‘liberal’ Muslims as also Government itself. As Allen & Guru (2012) note, it is likely that this was part of the impetus for the NMWAG: to challenge dominant expressions of Islam in Britain via the theology that underpinned it, not just those who were deemed ‘radical’. The National Muslim Women’s Advisory Group, which was set up under PREVENT, was conceived to “engineer if not exact power”. The present Strategy is filtering theological positions within Islam through the PREVENT’s definition of “extremism”. The manifestation of this policy has already realised discrimination based upon religious beliefs. If this is not an “attack” on Islam, because of which Muslims are being effectively castigated from public life, then what is? Imagine Jews being told they cannot engage with civil society, that their “extremist” organisations will be hounded for believing that their women are not allowed to drive? Or Christians being told that they are extremists for believing homosexuality is a sin? No, we know that the opposite is true; that the Jewish Beth Din court, for instance, is protected from investigations by the anti-Islam Home Office, and the label of “extremism” is mainly applied to Islam. The quixotic Cameron wants to only save British Muslim girls from “cultural practices that can run directly counter to these vital values”, not British/Israeli Jewish girls. For a person claiming that there is no conspiracy against Islam, Cameron fails miserably to convince the listener. Cameron’s policy on Islam will be to thus encourage the deconstruction of the faith it into something representing deformists like Maajid Nawaz and Usama Hasan. Nawaz has clearly stated that “we’ve got a serious, serious problem” with mainstream Islam, (not “Islamism”) that needs to be “tackled head one”. His scholastically pathetic solution is to “reform the way Islam is read today”. Mainstream Islam is therefore “under attack” from the head of the British State who is courted by individuals who were set up to fulfil a neocon function by Michael Gove no less; who have no credentials acceptable in the Islamic scholarly milieu, no expertise in counter-terrorism; and who are frankly despised in the broader Muslim community. The implication of Cameron’s own statements is that he will be pushing a state-backed version of a religion, picking and choosing a minority over another minority – ironically contrary to international human rights norms. Cameron’s statements epitomise the colonial discourse in more ways than one. Colonialism posited Western values above all others. As the British consul-general, Evelyn Baring, 1st Earl of Cromer (d. 1917) stated some century ago, Europeans were needed to introduce the “light of Western civilisations”. “Extremist”, thus replaces “backward” and “uncivilised”, yet the underlying colonial dynamic remains. “It is absurd to suppose Europe will look on as a passive spectator whilst the retrograde government based on purely Muhammadan principles and oriental ideas, is established in Egypt… the new generation of Egyptians has to be persuaded or forced into imbibing the true spirit of Western civilisation”. Cromer therefore promoted the neo-Mu’tazili Freemason Muhammad Abduh (d.1905). The British recognised that “Abduh tried to break through the rigidities of scholastic interpretation” (something Maajid Nawaz is encouraging). They also revered him for his “liberal judgments” and as the “chief architect of the modern reformation of Islām.” In 1899, with British help, he became Mufti of Egypt against Al-Azhar, which was “hostile to him”. “…the Muhammadan Society of Calcutta has deserved well of its countrymen and of ourselves; and Maulavi Abd-ul-Latif Khan Bahadur, its Secretary, merits especial thanks. Whatever view a Sunni Musalman may take as to the religious status of India under our Rule, he will find that according to that view he is not compelled to rebel against our Government. Having helped found an Islamic opinion which suppressed the revolutionary sentiments of the Indian Muslims, the British predictably honoured Abd-ul-Latif Khan Bahadur with various titles. As the British were busy breaking up Muslims using terms like “Wahhabi” for freedom fighting Hanafis in India, the very same Indian government was busy backing as a matter of policy and financially so-called “Wahhabis” in Arabia, and specifically, Abdul Aziz Ibn Saud. In other words British policy was both backing the House of Ibn Saud, and Sharif Hussain, who opposed each, at the same time. Moreover, British intrigues interfered with Islam and exploited a minor difference of opinion within Islamic jurisprudence, which professed that only an Arab from the family of Hashim (Quraish) could become a Caliph. The purpose was to split the Arabs from the Ottoman Caliphate thereby weakening it. Yes, what Cameron regards as “extreme” now (the creation of Caliphate), was an active policy implemented by the British government a century ago as part of their “game of chess”. Sadly such games it seems are being played now. Cameron’s speech has been lambasted especially by concerned individuals from amongst the Muslim community who feel targeted. The level of measures taken, to the glee of the Quilliam Foundation (which is clearly going to benefit from the proposals, as can be seen from their review of the counter-extremism policy), is set to have a censorious impact on human rights (ah, there is that “British value” again). It is also incredibly discriminatory. Yet as I have demonstrated above, Muslims have faced these colonial tactics in the past. By colluding with the likes of the neocon puppets at Quilliam to produce a speech that talks of “reforming” a global faith beating in the hearts of over a billion Muslims, Cameron has made his stance clear: he has joined the ranks of those who assisted in attempts to destroy the Muslim world and its Islamic epistemology. It is with poetic timing that this month the other secular leader who has interfered with Islam is the mass murdering Bashar al-Assad. As long as Cameron lends his ear to toxic, disreputable individuals, perpetuates neoconservatism from the pulpit of Parliament, and speaks to Muslims as the colonial master did to his subjects, his policies will resoundingly fail. My message to David Cameron, the neocons and their enablers ostensibly from the Muslim community who wish to deform Islam is, we have been here before. We are cognizant of your designs. We will resist your plans. You may plot, but we maintain an unshaking belief in the Plan of Allah. And indeed, without an atoms worth of doubt, Allah is the best of planners. This entry was tagged Abd-ul-Latif Khan Bahadur, Abdul Aziz Ibn Saud, Al-Azhar University, Bashar al-Assad, Birmingham Speech, British colonialism, British values, caliphate, Chris Allen, civic religion, colonialism, counter-extremism, David Cameron Birmingham Speech, David Cameron reform Islam, David Fromkin, deform Islam, Evelyn Baring, extremism, Hanafi, Indian Musalman, Iraq war, Islamic reformation, islamist, Maajid Nawaz, Muhammad Abduh, Muhammadan Society of Calcutta, Muslim minority discrimination, neoconservatism, Ottoman, Paul Wolfowitz, Prevent strategy, Quilliam Foundation, RAND Corporation, Reginald Winsgate, Sharif Hussain, Usama Hasan, Wahhabi, William Wilson Hunter. Bookmark the permalink.